We hope you enjoyed our Holiday Gift Guide last week. Things are returning back to normal around here and we’ll be enjoying a midweek break for American Thanksgiving. Time to check in with what’s going on around town. Be prepared, things might get a little silly. [full][/full] [fifth width=”30px”]–[/fifth][fifth width=”70px”] [/fifth][three_quarters][plain]We hope your break is refreshing Filip! We’ll try to rebuild your house while you’re gone. Or at least make it less on fire. In the mean time there will still be plenty of great articles here at iSlayTheDragon and all around town. [full][/full] [fifth width=”30px”]–[/fifth][fifth width=”70px”] [/fifth][three_quarters][plain]Is she actually going to join us or is she still out there listing games? [/plain][/three_quarters] [full][/full] [fifth width=”30px”]–[/fifth][fifth width=”70px”] [/fifth][three_quarters][plain]Or Castle of Burgundy. Or Troyes. Or…[/plain][/three_quarters] [full][/full] [fifth width=”30px”]–[/fifth][fifth width=”70px”] [/fifth][three_quarters][plain]Guess we’ve got some time to kill. She’s got to run out of games at some point, right? [full][/full] [fifth width=”30px”]–[/fifth][fifth width=”70px”] [/fifth][three_quarters][plain]Or Quarriors! Or Marvel Dice Masters. Or King’s Forge. Dominion – I had the opportunity to teach Dominion to some new players this week. I love watching someone experience Dominion (or deck building) for the first time. Those early mistakes and the learning process of how to build your deck is great. Action chains that don’t go anywhere and the realization that boring old treasure cards are sometimes the best investment. It’s addicting and we ended up playing 7 games in one sitting that lasted until 1am. We were back at it a couple of days later and feeling adventurous so I got to pull out a couple of Dark Ages cards. After 10 plays I was happy to share that we’d probably only seen about a third of the cards (if that). It’s amazing how much replay value Dominion offers. Even after over 200 games I’m still enamored by it. For various reasons I haven’t gotten to play much Dominion this year but playing again reminded me why it’s in my top 5 as well as being my most played game since I started recording my plays in 2011. It’s still my favorite deck builder and I’m more excited than ever for the new expansion. One Night Ultimate Werewolf: Daybreak – My good buddy and ‘dragon quitter FarmerLenny brought the new expansion for our group-favorite game to game night, so obviously we had to try it out. This was my first time playing with 9 players, on top of the whole Daybreak expansion and it was… well, it was overwhelming. It’s hard to tell which had a greater effect on the game, the player count or the new roles. I think we made a mistake by throwing too much newness into the first round. With 9 crazy unique roles, it’s really hard to remember what each one does – and thus, really hard to bluff who you are or are not. Everyone was too confused to try and pretend to be something they weren’t. In the second round we toned down the abilities and put some villagers back in, and had a much better game. Partway through I (who had started as a villager) realized I was probably a werewolf and tried to convince everyone to kill the so-called “Troublemaker” who claimed to have switched me and another player (who likely started as a werewolf). It would have worked too – a lot of fingers were pointing his way – except the Bodyguard protected him… and I found myself in second place and thus the one who was killed. Wildly enough, the troublemaker (he really was) had gotten confused and actually had switched another card, not mine. So I, a lowly villager, ended up dead. Daybreak has some fun new roles, but it also has a few I’m not so certain about. What makes ONUW fun is a little bit of information and a LOT of uncertainty – but now, certain characters (the revealer and the Aura Seer) get a LOT of certain information – they see their stuff AFTER all the cards have been switched and moved. When those roles were in play it quickly became clear who was telling the truth and the discussion was less chaotic and fun. Perhaps it was just inexperience and the roles would be more fun once we knew how to bluff them better… only time will tell. 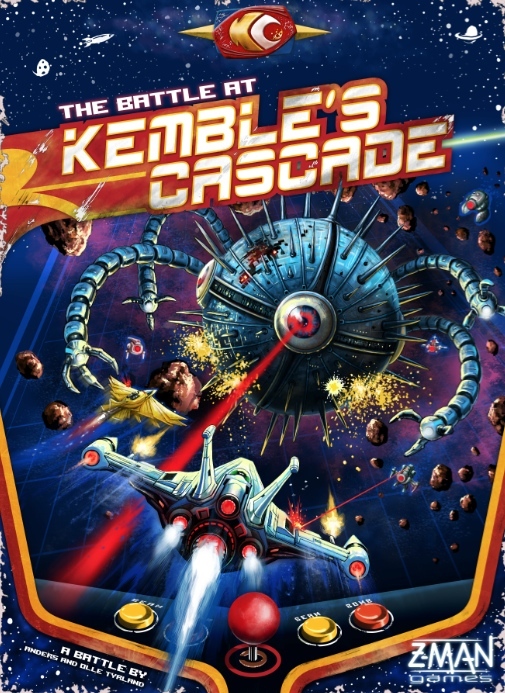 Battle at Kemble’s Cascade – I just received the game this week and was HAPPY to get it to the table after only a demo at Gencon. It was a rough start – my first time explaining the rules, and I could (and will) have taught them much better. I also didn’t enforce the turn order as much as I should have early on, because Threat wasn’t really happening yet. But then, when threats DID start flying in, people got a little confused.No matter, the game was still darn fun. I love the theme, and the low-luck gameplay that puts the emphasis on your actions. The Threat Level does a huge job bridging the gap partway between random dice rolls for attack and simple bigger-numbers-win combat. It lets you take risks and do ridiculuosly cool things if you plan it out right. So, I spent my time zipping around the board, firing my fully-upgraded Gamma Ray across the board, sweeping enemies to bits (I’ll have to make sure I did that correctly, it seemed QUITE powerful), and ramming ships to complete my mission. We all got a few achievements, we all shot each other to bits, and I think we all had fun – although we all agreed a future play would likely move along much more quickly, the game would not take as long, and we’d all have a lot more fun. This game will be back many, many times. I think there were several factors in play for ONUW. I liked the big group game more than I thought I would, but it did seem like it was a little much. I think the problem was big group, new roles, and completely new players. It looked like everyone still had fun (if not just for the spectacle of it), but it was a little crazy.